Legalmaster'79: released on February 1st, 2019. Below you'll find a list of most of the features that we added in Legalmaster'79. We highlighted in red those we think you are likely to find most useful, but weve found often that the features we find most trivial excite many of our clients. Some items appear in more than one category. We also tried to give credit to whoever suggested each feature; please forgive any omissions. Call or e-mail if you'd like to know the upgrade fee for your configuration of Legalmaster modules. You may "print" any of your MIRC reports automatically at a set time, for example, every day at 3am. This is particularly useful if you want to generate a report daily to send to your cost-recovery software. For example, you could produce a file that contains a current list of your open matters every night. You can set your print-to-file in data format delimiter character to comma, tab, or pipe. Previous versions use only commas. In MIRC for Transactions you may perform and/or searches for text in any of your 20 case description lines. For example, you could search for all matters whose 3rd line of description contains both Smith and Jones. Since so many of you are taking advantage of Legalmaster's feature that lets you include narrative description codes in your 20 lines of matter description, MIRC for Transactions now fully expands those codes and wraps the description onto multiple lines. You may sort any of your lists by its first column, such as client code, alternate ID, invoice number. In Legalmaster'78 we added the ability for you to establish matter phase fee budgets in hours. Since so many of you like that capability, we added the option to budget in dollars, as well. You've had the ability to set a budget at the matter level for decades. Now your matter-level budget amount is honored as you enter fee transactions in both Host and Remote to warn you as you reach it. When you import fee transactions from Remote, the reject report will include a warning if you've reached your matter's phase fee budget. When you import fee transactions from Remote, the reject report will include a warning if you've reached your matter's fee budget. We've added a window to make it easy for you to delete old backups of your imported batches. You'll get a warning as you enter data in Remote if you've reached your matter's phase fee budget. If you've reached 90% of a phase budget or a matter budget, you'll get a warning on the screen as you import Remote data. You may delete multiple billings in one step (Marf/DAndre). We now produce an audit trail report for new or altered clients, matters, & conflicts. You may print it to paper or store it as a text document. You may hide inactive clients (Judy/Cowell). You may tell Legalmaster to put remaining overpayments into your matter's retainer account when you run the billing generator. If you've reached 90% of a phase budget or a matter budget, you'll get a warning on the screen as you import data with Generic Import. We've added a similar warning on reject report when Fee budget by Case reached. LEDES 98b International format (V2) is available. All LEDES formats give you the option of consolidating indirect costs that share a grouping code. This is useful if you import your photocopies, for example, from a cost-recovery device and, as a result, have many entries for one invoice. Legalmaster'78: released on March 5th, 2018. Below is a list of most of the features we added in Legalmaster'78. Those highlighted in red are the ones we think you are likely to find most attractive, but experience has shown us that often the features we find most mundane are treasured by many clients. You will find some items in more than one category. We tried to give credit to whoever suggested the feature; please forgive any omissions. Call or e-mail if you'd like to know the upgrade fee for your configuration of Legalmaster modules. You may choose to hide non-billable transactions on the list/alter screen (Aric/Durbin). The Delinquent Account Tracking screen now lets you enter a minimum A/R value. Accounts whose A/R is less than that amount are skipped when you scan through your list of delinquent clients or matters. Eight more reports may be saved directly to a pdf file, viz, A/R Aging, A/R Balancing, Aged WIP by Case, WIP & A/R, Aged WIP by Employee, and all three of the ledger card reports. Those of you who use Legalmasters Calendar module are going to love this one. You may specify an employee and a number from 1 through 9. When you launch Legalmaster, Host or Remote, all calendar items assigned to that employee and that are scheduled to occur within the number of days you selected are displayed. Items scheduled for today have their dates and times in red. We added a new table called Budget Phases. It lets you assign budget hours to phases of your matters. We added an option to let you display 1-9 days of upcoming events when Legalmaster Remote launched. Legalmaster'77 was released on May 2nd, 2017. Here is a list of most, but certainly not all, of the enhancements. We highlighted in red the ones we think are particularly cool. Some items appear in more than one category. We tried to give credit to whoever suggested the feature; please forgive any omissions. Call or e-mail if you'd like to know the upgrade fee for your configuration of Legalmaster modules. You may print all outstanding invoices for a matter or client from the account status open item list with the option to show each invoice with just its credits. As a result you may send a client a set of his outstanding invoices with each one showing only its remaining balance. You may unpost trust transactions from the Trust Activity Screen. We include each matters case status 1 and 2 on case matches (Janet/Hutchison). When your search includes your transaction descriptions, you may supply a transaction date range. We now omit the CCA, RA1, RA2, RA3 captions if you didnt enter data in those fields, making the search results a bit simpler and cleaner. You may supply two names or phrases and ask Legalmaster to search through your transaction descriptions, case descriptions, and calendar descriptions for those that contain either of them or both of them. We reject fees assigned to an inactive employee when you import from Remote. In one click at the Host main screen you may see a list of the workstation ID's of Remote batches that have not been exported and Remote batches that have been exported but have not yet been imported. We added an "ethical wall" capability so that you may specify matters for which particular timekeepers may not see or enter time (Amy/Trucker). We offer an option to automatically capitalize the first character in your transaction description (Catherine/Prindle & Sheri/Tuttle). You may move an entire invoice between matters in one step (Marf/DAndre). We added an option to expand the list alter to full monitor width (Ernie/Rosen). Legalmaster hints appear on the list alter screen if its expanded to the full width of your monitor's screen. We reject fees assigned to an inactive employee in Generic Import. You may assign colors to Calendar Item Types. Legalmaster hints appear on the transaction list/alter screen if you select the option to expand it to full width of your monitor. You may print all outstanding invoices for a matter or client from the account status open item list with a new switch to show each invoice with just its credits. As a result you may send a client a set of his outstanding invoices with each one showing only its remaining balance. The aging section now includes the current A/R balance as well as past due amounts in the aging section (Judy/Owen). You may now range on phrases of text anywhere in your transaction descriptions. Not only that, but you may also supply two phrases with an and or or capability. For example, you could search for all transaction descriptions with Smith or Jones in them or you could search for all transaction descriptions with both Smith and Jones in them (Diane/Brunn). When you reopen a dummy, you may also automatically reopen all its receptors (Sheri/Glaspy). Most any change you make to a dummy, such as RA1 or Case type, you may apply to its receptors, as well. You may assign a color to a Calendar Item Type; it will appear in that color on both your event list and your month view screen. With one click at the main menu, you may see lists of all of your Host unmerged batches, your Remote unexported batches, and your Remote exported but not yet imported batches. This is very useful to determine who your slackers are (as if you didn't already know) or if you plan to run any global change utilities. You may unpost trust transactions on your Account Status Trust Activity Screen. We released Legalmaster'76 on July 11th, 2016. Below is a list of most of our enhancements. If we remembered who suggested a change, we indicated his or her name and firm in parentheses. Please accept our apologies if we omitted you. If you request to print an A/R Ledger card report from your client A/R ledger screen, you now have the option of separating the cases or merging them. You may look up matters by any case description line. You may view on the screen as many statements as you want. We added your clients name and case description line #1 to input and alter audit trails. If you print your Pre-bills to screen, you may click on any transaction line to display that entry on the transaction alter screen. After your favorable response to the ability to bold text in the statement header comment, a feature we added in Legalmastert75, we did the same for the statement tail comment. Just as in the header *b turns bolding on and off. You may print to screen multiple independent statement jobs. More than one user may print statements to screen simultaneously. When you print Pre-bills and you use Legalmaster split billing feature, you have the option to print a dummys receptors immediately after the dummy. The billing generator audit trail now includes the client name and case description. The option to require electronic billing task, activity, and expense codes may now be turned on or off at the matter level. Prior to this change, this switch was at the client level. You may expand the client entry screen to the full width of your monitor. You may display a list of matters to which you recently entered transactions, thereby reducing the length of your drop-down list. We added an option that lets you increase the size of the transaction description box. You may set as a default the larger description box. We automatically copy the most current version of our help file, lmwhelp.chm, located in your Legalmaster program folder in to a folder we name lmwhelp on your C drive. This bypasses Microsofts restriction which otherwise prevents you from reading the help text. We will be shipping Legalmaster'75 beginning August 17th, 2015. Here is a list of most of our enhancements. If we remembered who suggested a change, we indicated your name and firm in parentheses. Please accept our apologies if we omitted you. You may upgrade from any earlier Windows version of Legalmaster to Legalmaster'75 in about 10 minutes. You do not have to convert any data. With a single key stroke you may increase or decrease its size considerably. You may show a subtotal of your fees prior to a write-down, followed by the itemized write-down and the net fees total. When you execute the billing generator from account status WIP screen, you may set the billing date and the cut-off date. As a result, if you want to make it appear as if you billed a matter on a date that differs from Legalmaster's system date, you may do so easily. You may reuse an old, previously deleted, invoice number when you run the billing generator from the WIP account status screen. Consequently, if the amount of cleanup you must perform on an old invoice is such that it saves you time to unbill it first, when you rebill it you may assign it the same invoice number it had. We have increased the sizes of the Account status menu, the A/R ledger screen, the Open Item screen, the Retainer A/R screen, the Retainer Balance screen, the WIP Summary screen, the A/R Summary screen, and the Trust ledger screen. You may now subtotal fees by employee as a screen display option. You may also subtotal fees by trans date as a screen display option. You may restart an entry's clock from view batch screen with a single mouse click. We added the ability to display a list of all employees assigned a particular rate code. This was the most time-consuming enhancement of Legalmaster'75. On Revenue Allocation MIRC reports, you may now allocate payments, adjustments, and retainer transfers based upon when the work was performed as well as when it was billed. Prior to this version, you could, for example, ask to see what you received in fee payments during the month of August that were applied to fee billings that were generated in May. While you can still do that, you can now also ask Legalmaster what payments you received in August for work performed in May, regardless of when the May work was billed. We indicate on the conflicts match report if you've flagged a client as inactive. We show date case closed on case matches. We will be shipping Legalmaster'74 beginning September 15th, 2014. Below is a list of most of the significant enhancements. Those of you who we think suggested a feature are indicated in parentheses. We apologize to any of you we omitted. You may upgrade from any earlier Windows version of Legalmaster to Legalmaster'74 in about 8 minutes. You do not have to convert any data. The Report Stacker is back, new and improved. Since the release of Legalmaster'73 last year, all of Legalmaster's reports are written in Delphi. That made it possible for us to rewrite the stacker, allowing you to create a list of any Legalmaster reports to be run one after another. We added the ability for you to print multiple copies of the same report (Mary Weeks). You may start the stack at any point, not just at the beginning. You may easily change the order of reports in the stack. You may tell Legalmaster to skip one or more reports without deleting them from the stack, thereby making it easy to reinsert them later. Reports may be printed to screen, file, or paper; MIRC's and statements may be created as pdf's. Statements expand case description lines if they contain narrative codes. Final credit balances on statements print in red. Please forgive us for saying this feature requires a color printer. Pre-bills expand case description lines if they contain narrative codes. MIRC for Transactions expands case description lines if they contain narrative codes. We added an option to hide inactive clients from the drop-down list (Judy/Cowell). You may add client type and office codes on the fly. The dummy/receptor reallocation is now available at the client level as well as the matter level and is accessed at the client screen. You may now include any of your Narrative Description Codes on your Case Description lines. As a result your case descriptions may be thousands of characters long. They will expand on pre-bills, statements, MIRC's, even in electronic billing files. You may add narrative description codes from the matter entry screen. You may add case type, department, and statement message codes on the fly. Dummy/receptor reallocation is now accessed at the matter entry screen. You may add fee or cost transactions to an existing invoice without having to unbill the invoice. This is a tremendous time saver. This means that you may now make any change to an existing invoice, add entries, delete entries or modify entries and preserve your invoice number. If the first case description line contains narrative codes, they are expanded on the echo line. List/Alter Billings lets you print the entire list of invoices that you display. You may now specify the billing date case-by-case when you run the billing generator in list mode. This means you no longer have to change the system date if you wish to predate a billing. We also added a warning should to try to bill a matter twice in the same list with the same billing date, a forbidden practice. You may set a time, such as midnight or 1am or 2am, for Remote to automatically close. That way, Remote is not open when your backup software or anti-virus scanner runs in the middle of the night. A new Help/About screen summarizes the paths to all of the folders Remote uses. This is very useful when you add new or replace old Remote workstations. LEDES electronic formats expand narrative description codes that you use on case description lines. Task codes on LEDES electronic bills may be of any length. For the past decade we have been rewriting all of Legalmaster's reports and utilities using a programming language called Delphi. (That means no more Bridge.) With the completion of Statements in our previous release, Legalmaster'73, we finished all of Legalmaster's major reports. We are now tackling the few remaining utilities that remain in SBW, the older language we're replacing. While most of the differences are in the background and are automatic, such as a dramatic improvement in speed, we have made a few functional enhancements, as well. We are delighted to announce the release of Legalmaster'73. Here is a list of many, though not all, of our new features. If we remembered who suggested an enhancement, his or her and firm name are in parentheses at the end of the item description. Call or e-mail for clarification or for prices. We think the most exciting changes to Legalmaster have to do with the production of billing statements. We spent almost four years working on this part. For the past ten years we have been rewriting all of Legalmaster's reports using a programming language called Delphi. (That means no more Bridge.) With the completion of Statements, we have finished this project. While most of the differences are in the background and are automatic, such as a dramatic improvement in speed, we have made a few functional enhancements, as well. You now have font control, with the letterhead independent of body of the statement. As a result, if you choose a proportional font, and, except for Courier, they are all proportional, your long statements are likely to use less paper. You may print statements as pdf files and, if you wish, e-mail them. You may print the client totals page without printing the underlying matter statements. You may print a statement for matter that's on hold, with a warning, of course, from Acct Status (Kim/Reiling). The column widths in the fee analysis section are dynamically allocated to make for a more attractive display. The length of the lines under numbers is dynamically changed to match the length of the number. It's our guess that the Remote Transaction Data Entry module gets more use by our clients than any other part of Legalmaster. Thousands, of not tens of thousands, of transactions are entered every day. As a result, with so many users, many of them attorneys, we get lots of calls and e-mails with suggested enhancements. You may now display and edit any transaction's complete description on the view batch screen (Jeana/Morris). You may set an Option so that viewing the complete description on view batch screen is set as a default. You may expand your view batch screen to the full width of your monitor, thereby allowing you to see most or all of the description in the list. You most recent sort request on view batch screen is preserved. We added an Time at a glance screen allowing you to see a calendar view of your submitted hours. This is similar to the Employee Time at a Glance that's in the Host Transaction List/Alter screen. You may print a report showing employee time at a glance calendar with a couple of key strokes. Remote users may access to both the client search (grid view) and the case search (grid view) windows (Pat/Owen). These are identical to the search features available at the Host client and matter screens. You may specify a single timekeeper on the Remote batch report (Karen/Rosenfeld). In the past few releases we have been trying to make the account status screens a one-stop shopping center for the billing process. In earlier versions we let you run the billing generator and print any statement for a matter. Now you can to post an invoice to history from A/R Ledger screen. From both the A/R ledger and open item invoice list, you may Unpost an invoice from History. You may print a statement for matter on hold (Kim/Reiling). You may set an option so that negative numbers appear in red or with a minus sign. We now display each transaction's description on View Batch list. You may alter your transaction description on the view batch screen (Valerie/Brunn). You may print a report showing the data on the Employee Time-at-a-Glance screen with one click. You may to post an invoice to history from A/R Ledger screen. You may unpost an invoice from history from the A/R Ledger screen and the Open Item screen. From the Unpost menu, you may unpost by invoice number range (Sharon/Crary Buchanan) or client/matter range. You may also Unpost using a list of invoice numbers or matters. We now print the descriptive annotation at top of 1st page of each MIRC report, suppressing text between double slashes (Diane/Freeland). This makes it easier for you to ensure that those who read your reports have a better notion of what they purport to show. Legalmaster ignores text places between pairs of double slashes in transaction descriptions for LEDES98b and LEDES2000. We added an option to let you calculate the hourly billing rate before rounding hours on split matters. We added a link to our website at the Main Menu. We are pleased to announce the availability of Legalmaster'71. Below you will find a list of many of the new features. Call or e-mail for clarification or for prices. You may upgrade from any earlier Windows version of Legalmaster to Legalmaster'71 in about 5 minutes. We require no conversion of data. You may open multiple acct status screens simultaneously on the same or different clients or matters. You may expand the invoice history box thereby increasing the font size. We added a new button on Trust activity screen to print the corresponding Trust Activity Report. Numbers on the screens are dynamically updated. For example, if you run the billing generator from the WIP Summary screen, the unbilled amount is immediately reduced and the billing line appears on the A/R Ledger and Open Items windows. There is a station-specific option to increase screen size. You may now increase the screen sizes for the four most often used Legalmaster screens: Client entry, Case/Matter entry, Transaction Entry and Remote Data Entry. You may turn on an option to perform a spell-check whenever you merge a transaction batch. When you enter an unapplied adjustment, you may designate its transaction type. (Manorma/Durbin, Larimore) This lets you, for example, prevent overpayments from being classified as fees. You may block text in the description and convert it all to upper or lower case. You may print any MIRC report as a PDF. And immediately e-mail the pdf anywhere. In MIRC for Fee Transactions we added a new field - table billing rate amount - as long as the report includes at least the matter and timekeeper. As a result, your report can show you not only what you're charging per hour, but what you'd like to be charging per hour. You may increase the Matter screen size just as you could to the Client screen in Legalmaster'70. You may now search for matches of text embedded in your Conflicts list just as you have always been able to in your Client names, Matter descriptions, Transaction descriptions, Calendar data and Case Management data. Once a user has specified the matter, you may display the client's and matter's accounts receivable. You may set this as a default so it pops up immediately. You may set a switch so that a spell-check for your entire batch is performed when you export it. We added a number of features to prevent common mistakes during the export/import process. We modified our export file naming convention to prevent you from accidentally importing data directly from your Remote data folder. We display a warning message if you attempt to export data to your Remote or Host program folder, your Remote or Host data folder or a local drive if your validation folder is on a shared drive. We print an audit report when you export your data showing where you exported your batch and the location and name of its backup. You may click to display a log of your exported batches. We made "yes" the default for "include client name" on audit trail report. You may select any printer for your batch report and export audit report. You may set as a switch to force Legalmaster Remote to print a batch report whenever you export. When you print your batch, your answers for Paginate, Subtotal by Employee and Include Client Name become the default until you change them (Yolonda/Demler). Here is a list of many of the features we have added to Legalmaster'70 along with brief descriptions of how they might be useful to you. Call or e-mail for clarifications should you find these descriptions too terse or insufficiently limpid. You may upgrade from any earlier Windows version of Legalmaster to Legalmaster'70 in about 5 minutes. We require no conversion of data. Call or e-mail for prices. We've added spell check to global options. So, not only can you spell check individual transactions or your entire entry batch, you may now spell check any transactions that you can mark on the list/alter screen. You may search or replace text for any displayed transaction (requested by the Dwyer firm in Honolulu). You may now spell-check or perform the search and replace functions on split (dummy/receptor) transactions (requested by the Demler firm in Long Beach). As you enter transaction description, if you right-click on a narrative code in the drop-down list, it's popped right into the description. You may display the description of any transaction right on the on list/alter screen (by right-clicking on it). The transaction list/alter screen now has a button labelled "Edit Description." Click it to display any highlighted description to edit, cut, copy, paste, search, replace (right-click for popup menu) and change case from upper to lower or vice versa. You may perform a text search of any transactions's description from list/alter screen after right-clicking to trans to display it. For those of you who prefer the keyboard to a mouse, we've added keyboard means of checking transactions on the list/alter screen and displaying the options menu. You may now request a statement to be printed directly from the Alter Billing screen. We've added a station-specific option to turn off the automatic display of case "notes." We've added single key stroke methods of moving the transaction forward or backward (suggested by Mary Weeks). We added a station-specific menu option to delete backups of merged batches, making it much easier for you to maintain the contents of your TRANBACK folder. You may now right-click on any cost on the list/alter screen to display its entry date, markup factor or billable units, Dummy-receptor status, Hold status and No-bill status. We've color coded costs on the list/alter screen to make it easier to quickly identify those that have unit rates or markups. You may toggle hold status for costs as well as fees. We have rewritten Revenue Allocation MIRC from the SBW language into a language called Delphi. This is the last of Legalmaster's MIRC's to have undergone this process. As a result, it runs significantly faster, automatically resizes the font to fit on your paper, and is more "fault tolerant." We took this opportunity to add some new features, as well. Read on. 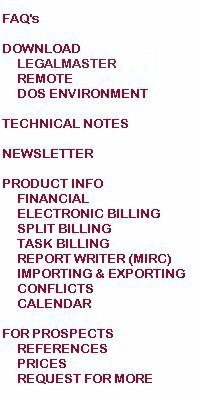 Revenue Allocation MIRC now included the ability to include columns containing unbilled values. As a result you no longer need to run two reports to get your WIP, Billings and Collections by working attorney. We added the ability for you to include your own calculated fields on Revenue Allocation MIRC reports. For example, you may add fee payments to fee retainer transfers to gat a total of "fee credits." In both MIRC for Cases and Revenue Allocation MIRC, if a report includes both a percentage column and a range on a financial field, the percentage reflects its share of the total of all cases, not just those in the range and the user may print an addendum including the records outside of the range. For example, should you ask for a list of all clients who owe you more than $5000 along with what the percentage of your total A/R each represents, the percentage printed on the report will be of the grand total A/R, not of the smaller total that prints at the bottom of the page. We added an option to MIRC for Transactions that lets you suppress any text that appears between pairs of double slashes. This lets you produce reports to be sent to your client honoring the same restrictions that apply to statements. We added a button on the Account Status Open Item Screen that lets you print the corresponding report. You have the station-specific option to increase the screen size to any of three settings. We added a station-specific option to turn off the automatic display of case "notes." Your Statement Characteristics Table names now appear in the drop-down list on the matter screen. We added a station-specific option to change screen size to any of three settings. There is now a station-specific option to turn off the automatic display of case "notes." We added a menu option that lets you delete back-ups of your batches exported from your workstation. You may mark and import multiple Remote batches all at once. On open item screen, we added an button that lets you print A/R Aging by invoice for whatever client or matter you're displaying. As we did elsewhere, we added a station-specific option to turn off the automatic display of case "notes." You may now produce files in the LEDES98b format without creating the intervening MIRC file. This will greatly streamline the process. Here is a list of most of the features we have added to Legalmaster'69 along with brief descriptions of how they might be useful to you. Features which fall into more than one classification appear under each appropriate heading. Call or e-mail for clarifications should you find these descriptions too terse or insufficiently limpid. You may upgrade from any earlier Windows version of Legalmaster to Legalmaster'69 in about 5 minutes. We require no conversion of data. Call or e-mail for prices. We added grouping code to the list/alter search. This facilitates your searching for particular fee and cost transactions. You may suppress the printing of hours for individual fee transactions on statements, making it easier for you to show flat-fee transactions on the same bill on which you show hourly activity. This allows you to keep track of the actual time you spend on such flat-fee work without having to burden your client with such confusing detail. You may designate a client as inactive, thereby eliminating him from the drop-down list on transaction entry screens. If you've had Legalmaster for decades, as many of you have, this could significantly reduce the length of your client drop-down list, saving you oodles of time. Inactive clients still may appear on reports. You may also designate an employee as inactive. This is intended for ex-employees; it is not a comment on people's work habits. Inactive employees do not appear on the drop-down list when you enter fees. We've added global search and replace for text in transaction descriptions. The situation that kindled this idea was the misspelling of a clients name in over 100 transactions. When you enter a Retainer Billing, Legalmaster sets all three dates, entry, cut-off and billing, to the same value for you. For those of you who accept credit cards, we have added a button that both saves the payment transaction and launches the web site of a popular and relatively inexpensive credit card processing company, Merchants Warehouse. This is an optional add-on and requires that you make a deal with Merchants Warehouse to process your credit card payments. Those Legalmaster clients who have done this already have told us their fees have been significantly reduced. Contact us for details. You may store up to eight e-mail addresses for each client. If a client has no open matters, you may designate him as inactive, thereby eliminating him from the drop-down list on transaction entry screens. You may store up to eight e-mail addresses for each of your matters. We have added a third type of matter level address. In addition to the substitute and additional addresses already available, we have added hidden addresses. This feature lets you store addresses without having them appear on your statement. One Legalmaster user intends to use this to store the address to which his client relocates in the Winter months, at which time he temporarily changes it to the "substitute" address. We added the ability for you to bill a matter right from the WIP Summary screen. If you want to bill just one case, you need not bother going to the billing generation screen, at all. You may enter an invoice number and find out to whom it's assigned, regardless of whether it's in current period or history. You may link in a single click directly to the client or case (matter) entry screen for whoever's data you're viewing. We increased the number of lines of Delinquent Account tracking notes from 10 to 36. You may print a Trust Ledger Card report directly from the Trust Ledger screen. You may supply a descriptive name to each table in addition to the code you already assigned it. In the statement header, statement footer and case description lines you may insert the characters **date**. When the bill prints, the statement cut-off date appears in the place of those characters. We added the ever-popular totals only option to the WIP & A/R Summary Report. This saves reams of paper if all you're interested in are grand totals or subtotals by Responsible Attorney or Client Coordinating Attorney. You may summarize time by calendar month, quarter or year on the Missing Time Report. We added the Billing Rate Code to the header section of Pre-bills. You may print Delinquent Account Tracking Notes in MIRC for Cases. The billing generator program has been rewritten in a language called Delphi, the language we use for all of Legalmaster's data entry screens. This is continuing a process we have been working on for the last few years of phasing out all Legalmaster programs written in SBW. Delphi programs run faster and are more fault tolerant. There are very few programs left in SBW. We're working to convert all of them. Switches on the client entry screen that indicate a client requires task, activity or expense (electronic billing) codes are now honored in Remote just as they are in Legalmaster's Host. If you check the appropriate boxes on the client screen, Remote will force you to enter the codes your client demands. This prevents you from having to remember which clients call for these codes. Clients and employees designated as inactive will not appear on the drop-down list. Each transaction type has a unique background color to help cue you when you change transaction types. If you import fees or costs for a client who demands task, activity or expense codes (typically used for electronic billing), the Import Module will reject those transactions that don't include such a code. If an employee has no current period fees assigned to him, you may flag him as "inactive" to prevent him from appearing on drop-down lists as you enter transactions. You may clear the screen while retaining your most recently used record keys. This makes it much easier, for example, to enter a new record for a client after having just examined one of his existing records. We added yet another way for you to assign an employee to an event. We added a link from the Calendar entry screen to the Calendar MIRC screen. You may search e-mail addresses that you added for clients and matters. A user lacking the rights to create a MIRC report may not import or export MIRC's either. Our newest Legalmaster rendition includes quite a few enhancements. Some are small changes that make Legalmaster easier to operate, others are much more profound. We will be adding more features over the next few months. Watch for e-mails. We have added six more options to the right click menu when you check multiple unbilled fees or costs. 1) Change all of their dates. 2) Change all of their employees. 3) Delete all of them. 4) Put them all or take them all off hold. 5) Copy them all to another matter. 6) When you move groups of fees, you have the option to have Legalmaster recalculate their billing rates. When you move fees between two matters, Legalmaster supplies as a default the same client code for the matter you're moving to as the one you're moving from. If you attempt to unbill an invoice to which current period credits (payments, adjustments and/or retainer transfers) have been applied, you are given the option to unapply automatically all such payments and delete the adjustments and retainer transfers in one fell swoop. You may create installment cost transactions in a manner similar to the way you have been able to create installment fee transactions. The alter audit trail is now written in Delphi. We have added an option to revalue your currency. We have clients in Venezuela whose Bolivar is to be devalued by a factor of one thousand on January 1st, 2008. You may apply unapplied cash directly from the account status screens. You may unpost from history an invoice directly from the A/R Ledger card or open-item screen. You may print a single invoice that shows all of its fees and costs as well as the payments, adjustments and retainer transfers that have been assigned to it. What results is the balance on that individual invoice. If you import an activity code (an electronic billing concept) and that code has a corresponding description in the Activity Code table, Legalmaster inserts that description at the beginning of the transaction's description (following the task and activity codes, of course). You may now import Legalmaster Conflicts data from any tab-delimited file, which means that you may import data from Excel. With this addition, Legalmaster now lets you import client data, matter data, fee and cost transactions and conflicts data from Excel and many other databases. Converting to Legalmaster from other products has never been easier. We used two languages to write Legalmaster, Delphi (Borland's Windows development tool) and SBW (Super Basic for Windows). All of the screens are in Delphi and, at one time, all of the reports were in SBW. For a number of reasons, we have been rewriting all of the reports into Delphi. The advantages for you are greater speed, more fault tolerance and more flexibility. For example, reports written in Delphi automatically resize themselves to fit on your paper; if you print a report in landscape, as opposed to portrait, Legalmaster uses a larger font. In our previous release, Legalmaster'67, we rewrote into Delphi MIRC for Cases, the Transaction Input Audit Trail and all three of the Ledger Card reports (A/R, Retainer and Trust). Now we have added MIRC for Transactions, Calendar MIRC, A/R Aging, A/R Balancing, WIP & A/R Summary, the Transaction Alter Audit Trail and Pre-bills. After you export a batch, Legalmaster sets the default transaction date back to the system date. You may print the data for just a single timekeeper in the Missing Time Report. We have added a "totals only" option to the A/R Balancing report and the WIP & A/R Summary report. If you select this option Legalmaster prints only the grand totals and, if you sort the report by Client Coordinating Attorney or Responsible Attorney, their subtotals, as well. You may delete all members of a list in one fell swoop. You may now close matter notes from your keyboard as well as with your mouse. 1) set top, bottom, left and right margins. Now you may punch holes and bind any way you want. As a result, you may make your Pre-bills much more terse. In addition, since Pre-bills are now written in Delphi, you may increase the font size merely by printing them in landscape. Two years in the making, Legalmaster'67 is ready for delivery. Most of these enhancements were requested by you, our clients. We've tried to give appropriate credit; please forgive us if we omitted your name from your suggestion. This list is not exhaustive. We will also be adding a few more features over the next few months which will be provided for no additional charge to users of Legalmaster'67. You may import clients into Legalmaster from any tab delimited file. That means you may import clients from an Excel or Lotus file. We added this feature to assist new Legalmaster clients converting their data from other software. We've added color cues to the transaction entry screens to reduce the likelihood that you enter a cost when you meant to enter a fee. You may specify the date to be assigned to an explicit "automatically distributed" set of write-ups or write-downs. Previous versions automatically assigned the ending date of your transaction date range to these entries. If you've assigned notes to a matter, whenever you enter the matter code on the transaction entry screen, its notes are automatically displayed. You may alter or add new notes for any matter here. We've rewritten all three of the ledger card reports (A/R, Retainer and Trust). Though this change has many benefits, what you're going to like best is that those reports automatically change their font size to fit your paper. You may import fee and costs transactions from any tab delimited file. That means you may import fees or costs that you entered in Excel or Lotus. We added this feature for attorneys who prefer to keep track of their time on a spread sheet as well as to assist firms converting transaction data into Legalmaster from other software. You may include fields that are calculated from other fields. This is a major enhancement. For example, you might add a new calculated field called "credits" as the sum of payments and applied retainer transfers, thus showing you in a single number how much has been applied to a case's or client's receivable. Another example might have you show the percentage change of this year's receipts as compared to last year's. You may now specify for any fee or cost field whether you want to reflect "invoiced" values, "not invoiced" values or both. Earlier versions always reflected both. You may range on Responsible Attorney in such a way that Legalmaster will find a match regardless of whether you stored the RA as either RA1, RA2 or RA3. If you've assigned notes to a matter, whenever you enter the matter code on the account status screens, its notes will be automatically displayed. You may alter the notes here. You may also add new notes for any matter here. Remote users are able to read, but not modify, case notes. We are accepting orders for this new release now. As long as you're upgrading from an earlier Windows Legalmaster version, the entire process may be done via e-mail. We will bill you at the same time that we send you the upgrade. Your upgrade fee depends upon what configuration of Legalmaster modules you have, how many concurrent users you have and what Legalmaster release you're running now. You'll have to contact us for prices. Legalmaster's Remote Entry module is useful for firms who want many people to be able to enter fee transactions and want most of them to do little else. We've added a few very useful new features to a spanking new version; here are some particularly attractive ones. If your Remote station has access to your host database (i.e., if your Remote stations and your host stations are on the same network), Remote users may display any transactions they have ever entered. Each Remote user may look up his or her fees by client, matter, date, invoice number, etc. Remote users may even use the slick "Employee Time at a Glance" monthly summary screen. Rest assured, though, that while Remote users may still alter their current batch of transactions, they may only view what they've previously exported. If your Remote stations do not share a network file server with the host, you may still take advantage of this new capability by copying four additional files into your Remote validation folder. The "view batch" screen has been dramatically expanded to include more columns, specifically, billable amount and transaction description. In addition, you may now sort the view batch display by any of its display columns - client, matter, date, group, hours, actual or billable amount and description. These enhancements make finding a specific transaction much simpler than ever before. You may now export your batch through a cut-off date. As a result you may, for example, export last week's transactions from your batch while still retaining this week's. We are now shipping Legalmaster'65. Here are some of the features we added. Two of them, the second and the fifth on this list, were the most frequently requested enhancements we have received in the last five years. Case MIRC: You may set column widths on alpha fields thereby allowing you to fit more data on a smaller page. This feature is now available in all five of Legalmaster's MIRC's. Transaction MIRC: If you sort a report by date, you may request subtotals by calendar month, calendar quarter or calendar year. You may also request to see only the subtotals; i.e., you may suppress the detail. The example below shows how many hours Frances recorded as software support for each month of 2004. Prior to this release this information would have required running twelve separate reports. Revenue allocation MIRC: You may set column widths on alpha fields thereby allowing you to fit more data on a smaller page. Case management MIRC: Case management MIRC's may include alpha and code data from the billing database. Transaction entry: You may run spell check on your entire batch at one time as well as one transaction at a time. You may exclude closed cases from the drop-down list. Each user on a network may set this independently. Held transactions are easily distinguishable on the list/alter display. You may isolate held transactions in list/alter. Remote: You may run spell check on your entire Remote batch at one time or one transaction at a time. You may omit closed cases from the drop down lists. Case management: You may import and export templates from one database to another. You may merge case management data into a Word document. You may spell check your text fields. Case management MIRC's may include alpha and code data from the billing database. The fee for this upgrade depends upon your configuration of Legalmaster modules. Contact us by phone or e-mail for details. We are now shipping Legalmaster'64. We've added a host of new features to make your life simpler. As usual, most of the enhancements resulted from your suggestions. Here is a list of some of them. At the account status ledger card screen, you may now click a single button and thereby print a ledger card report for the client or matter you're viewing at that moment. It works as if you went to the report menu and requested the ledger card report specifying the client, matter and date range. At a recent Legalmaster training convention, a few users mentioned that they occasionally get a payment that reduces the balance on an invoice to a small amount, often under a dollar. You may now set a threshold amount that tells Legalmaster to adjust off lesser balances automatically. At the account status WIP summary screen, the one that totals unbilled fees and costs for a client or matter, we added a button that lets you in a single click display every individual unbilled fee or cost transaction. In addition it places you in transaction alter mode! We've made a fairly sophisticated enhancement to the "automatic distribution of write-ups and write-downs" feature. As those of you who use this already know, it is quite a time-saver if you want to write up or down the fees for a matter and spread the amount of the increase or decrease proportionally among all of the timekeepers who worked on it. Although this ability is very useful if you want to keep track of the profitability of contingency or flat fee matters, many of our users have found it handy in any circumstance where they choose not to bill the "actual" value of their time. What we added this time is an option to make this write-up or write-down explicit or implicit, that is, itemize it on the bill or not. Whether or not you choose to show it on your bill, Legalmaster still distributes it properly among your timekeepers. The list/alter screen now lets you sort whatever transactions you are viewing by any of the data columns, client, matter, date, timekeeper, group, hours, amount, even the description. This is very useful if you're searching for aberrant entries. Also in list/alter, you may view the information not otherwise displayed for any transaction with a single keystroke - apparent and effective billing rates, billable timekeeper. You can now get a client or matter drop-down window while you're creating report lists. You may turn off the client drop-down list while you're entering transactions. Conflicts users may now create a look-up table of relationship codes. We added a "scan mode" to Remote Transaction Data Entry. It lets you jump from each entry to the next (or previous) with a single mouse click. You may begin your scan at any point in your list. This provides a very efficient way to find a transaction you're seeking. We made a couple of enhancements to the Calendar module. We created a screen that looks just like a wall calendar, seven boxes across, as many rows as are necessary for the weeks in any month. Specify an employee and a month and you'll see all of his or her appointments handsomely displayed on that calendar. You may then click on any of the days if you want to view the items in all of their excruciating fullness. We also added a much quicker way to add timekeepers to calendar items. We will soon be shipping the next version of Legalmaster, what we're calling Legalmaster'63. The migration to it is quite simple; users of our last DOS version, Legalmaster'97 may even convert directly to it. The upgrade fee is a function of which modules you have, your number of timekeepers and your number of concurrent users. You may copy and paste all twenty case description lines from one matter to another. You may copy and paste all or portions of name and address data among clients and case substitute and additional addresses. The maximum number of cases that may be put on a "list" for reports and the Billing Generator has been increased from 40 to unlimited. The "view batch" screen in transactions has been expanded. You may now view batch totals and today's totals for any transaction type, not just fees. Those of you who like to enter payments by invoice number will be glad to hear that you may set the payment entry screen to return to the invoice number field immediately after you save a payment. The audit trail numbers each transaction and you may alter any entry in your current batch merely by identifying it by its number. Those of you who enter large batches will appreciate this one. You may suppress MIRC's request for a page header comment. Two new features for those of you who use our "split billing" feature that lets you automatically divide work on a single matter among multiple clients. You may now type merely the "dummy" on a "list" and ask Legalmaster to add all of the dummy's "receptors" to the list. As you're entering fees or costs for a dummy you may display a list of all of its receptors and check only those you want charged, changing their shares on the fly or asking Legalmaster to proportion them based upon their "default" relative values. This is a big one. We haven't forgotten about users of Legalmaster Remote. If your "host" fails to import an exported batch, you may append to it from the Remote station. We occasionally add features to help to clean up data that was somehow damaged. Missing invoice search and repair finds and fixes "orphaned" payments and adjustments (i.e., transactions assigned to non-existent invoices). It also finds and posts to history zero-balance invoices that had refused to post. This can help you close old cases. A few weeks ago a client called us with an unusual error. We fashioned a solution that called for them to install a small file in their Legalmaster program folder and we e-mailed them the file. About two hours later they called to thank us; their error had disappeared and, more significantly, a report that had taken one hour to print two days previously now ran in three minutes! We scrambled for a technical explanation of this astonishing development and, of course, came up with one. As a test we sent this same small file to about a dozen clients. All of them reported similar results; reports run from three to ten times faster! We have put this file on our web site so that any of you may benefit from this discovery. Here's what you must do. This is going to get a little technical, so have the appropriate person deal with it. There is a file in your Legalmaster program folder. The file's name is NETWORK.BIN. Open it with Notepad or Wordpad. Exit from Notepad or Wordpad without saving the file. Run and time some Legalmaster report. Download from our website a file called 61ENV.ZIP. Unzip it. You will find that it contains about a half dozen files. Copy the file named NETWORK.NON into your Legalmaster program folder. Get everyone out of Legalmaster. Rename your existing NETWORK.BIN to something like NETWORK.OLD. Run the same report that you ran in step #4 and see if it's any faster. After thousands of programmer-hours and hundreds of luke warm pizzas, we have completed our latest masterpiece, Legalmaster'62. Requiring no data conversion whatsoever from Legalmaster'61, this painless upgrade adds quite a few useful and time-saving features. All you need do is download the most current version of Windows Legalmaster from our web site and copy a small file which we e-mail to you into your Legalmaster program folder. The cost of this upgrade depends upon what configuration of Legalmaster modules you're using. Contact our offices to find out your fee. If you are still using Legalmaster'97, you may convert directly to this new version. While these features are available today, we will be adding a few more in the coming months. They will be accessible to any Legalmaster'62 user for no additional charge. We are excited about one particular enhancement suggested to us by Dena Rafte, a client and Legalmaster dealer from Houston. We call it "Missing Time at a Glance." It displays what looks like a monthly calendar. In each date box are displayed the actual and non-billable hours of the timekeeper of your choice. The feature that received the most enthusiastic response when we unveiled the new version at our most recent training convention is the ability to share MIRC report formats across a network. As you may already know, Legalmaster's report writer, MIRC, allows each user on a network to design and save his or her own sets of reports. Heretofore, a user at one station could not see the reports created by another user. We have changed that. You may now copy or print reports created by other users. This has profound implications. We have increased the limit of the number of MIRC reports that may be saved by each user from 75 to 250. Have fun. Some of you have said that you can't always remember what each of your MIRCs actually prints based merely upon the name that you assigned it. You may now annotate each report with a fairly long description. The comment appears on the screen whenever you view the MIRC format. You may now store multiple ranges on the same field in your MIRC reports. For example, you may ask to see receipts for a list of responsible attorneys, skipping over the ones you're not interested in. Or you could ask for billings for seven areas of law, omitting the others. You may now modify a MIRC report that's part of a report stack. We've more than tripled the length of transaction descriptions. Assuming that you use narrative codes throughout your description, the maximum has been increased from 23,400 characters to 84,240 characters. Have you ever regretted deleting a client or a case? Well, those days are over. You may now undelete a client or a case. Transaction global change lets you bypass the warning that you have unmerged batches. We've received quite a few compliments as a result of the client and matter grids that we added to Legalmaster'61. This is the screen that displays all of your clients or cases in what looks something like a spreadsheet on your screen. Now we've taken those screens one logical step further. You may now search and replace data on those grids. For example change all cases assigned to responsible attorney ABC to attorney DEF. The Transaction Entry screen now shows both today's and batch totals of hours and amounts at the bottom. Transaction's list alter now shows the totals of the transactions that you display. You may now create a list of users and their work-station ID's (WSID) so that Legalmaster can tell you, for example, not only that a batch has not been merged, but whose batch it is. If you have occasion to use Legalmaster's split billing feature - the tool that lets you divide work on a matter among more than one client or matter - you have probably noticed that we warn you when you try to enter a transaction to a receptor. You may now turn off that warning message. The backup and restore utility has been greatly enhanced. You may now backup any of your data folders regardless of which one you're in at the moment. You may backup your data to any location, including a local drive or a zip disk. And Legalmaster remembers where you last backed up so that it can remind you the next time. You may convert a payment that has been applied to one or more invoices into an unapplied payment. This is useful if you want to alter a billed fee or cost that has been paid for. The account status screens and the transaction alter routines have been wed. As a result you may, for example, alter a fee or cost by selecting its invoice from the case's ledger card. We began shipping the 32-bit Windows version of Legalmaster in August of 2000. Experienced Legalmaster'97 users should have little difficulty with the new version, since we retained the same terminology and concepts. We think you'll be pleased with the new screens, especially transaction entry and MIRC. We've added spell check and a timer to the time entry screen. We offer a new feature called "grid view" to clients and matters, allowing you a birds-eye view of all of your client and matter data. The installation takes about five minutes and is done from a CD. If you are running on a network, you must undergo a one minute installation at each station from which you intend to access Legalmaster. The data structure for Legalmaster'61 for Windows and Legalmaster'97 for DOS are virtually identical. We have added some "keys" to the new system to take advantage of some cute Windows functions. The Windows version requires that your data be moved to a new folder so that these new keys may be inserted. This is a one-step process which takes about two to four minutes per megabyte of your data. When it's complete, your old Legalmaster'97 is still present and unaffected. If you are converting from our DOS version, we recommend that you install and play with the Windows version while you continue to bill with Legalmaster'97 for one or two billing cycles. This will give you ample "leisure" time to gain familiarity with the screens, make sure your printers are working, etc, etc. All Windows software is more demanding than DOS software. We recommend that you run Legalmaster'61 on a high megahertz Pentium with at least 64 megabytes of RAM. As is common with our upgrades, the fee to migrate depends upon your configuration of modules, your number of timekeepers and your number of concurrent network users. If you call us, we'll walk you through the formula and provide you with a precise cost. Legalmaster's manual is available now on our web site. Just go to Download Legalmaster and follow the instructions. This manual conforms to standard Windows help conventions - hyper text look-ups, index, contents. We keep the most current version of Legalmaster software and our manual on our web site to make it easy for you to stay current. While you cannot run the software on the web site unless you have first installed the system from the CD that we send you via mail, you may read the complete manual as soon as you download it. While Legalmaster's calendar software has been quite well received by those of you using it, it lacks one feature that many of you have requested, namely, the ability to store rules of the courts and calculate events based upon these rules. We are now offering a product that does just that and quite a bit more. That product is called Vision Docket; it is manufactured by a company called Compulaw. Compulaw's Vision Docket can import Legalmaster client and matter information via a Legalmaster data format MIRC report. The ability to produce such a report is built into Legalmaster'97. As a result, you don't have to reenter all of your client and case information. Vision Docket is available in both 16 bit and 32 bit Windows versions. Rules are available for over 200 courts. Since they change so often, rules are sold on a subscription basis. Although they vary in price, most are $99 each per year. To celebrate this relationship, we are offering our clients a discounts on Compulaw's products - 20% on the software, itself, 5% on the rules. Quite a few of you are using LIBRA, or Platinum accounts payable software and Legalmaster's Import module to send advanced costs from A/P to billing. We now have yet another option. We have noticed that many of you are Quickbooks users. One of our clients figured out a way to take Quickbooks' invoice data and export them as Legalmaster costs. As a result you may enter invoices into Quickbooks Accounts Payable and export them as costs advanced to Legalmaster's Import module. You need three things for this capability; viz., Legalmaster'97, our Import Module and a special ($50) conversion program. Call us for details. A new Legalmaster feature gives you the ability to import transactions that you wish to have treated as trust debits. This is part of a more general change to the Table of System Options. A new field lets you specify the transaction type of data you import (Fees, Indirect or Direct costs or Trust debits). This feature also lets you convert generic Cost records in our old '93 Import format into either Indirect costs or Direct costs.